Sabriya’s Castle of Fun Foundation (SCFF) is all about saving the lives of those dealing with life threatening diseases and those in need of blood. SCFF was named in honor of Danny Bakewell Sr.’s daughter, Sabriya Bakewell, who passed away of leukemia at the age of 17. The blood drive is an annual event which honors and celebrates Sabriya’s life and all the children. Patients with sickle cell disease have different requirements with blood donors that do not have C, E, and K red cell proteins. If a donor does not have these proteins on their red blood cells, their blood is reserved for transfusions for patients with sickle cell disease. Fifty-five percent of African Americans are CEK-negative, compared to less than 1% of the general population. SCFF considers blood donation a high priority because of the need especially for Black and other persons of color blood donors. There are certain blood types, which carry specific antigens that are only found in people of African descent or non-African descent. Because of the lack of Black blood donors, the need is specifically high for Black children, who are struggling with certain blood-related disorders such as sickle cell anemia. Most people avoid giving blood due to fear of needles or having the wrong information. If you are a first-time donor, after the initial pinch of the needle, the process is over. 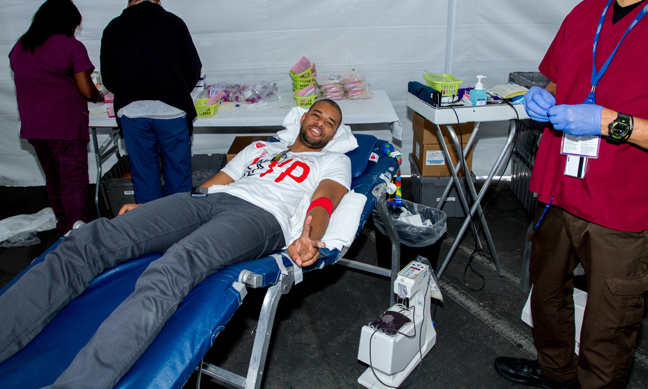 The few minutes spent giving blood is helping those in need and Children’s Hospital LA makes sure your experience is comfortable. There are three blood types: A, B or O. However those of African descent carry an antigen within their blood that is critical to helping others of African descent in recovery when blood transfusions are necessary. You can show your support by putting out the word to your friends and family to donate blood. There is a serious shortage of blood for children of color, so join the effort to help our children. If you are 17 or older, then you can donate! “We need—we meaning all of us, need to be the success, to be the match, to be the blood donors,” said Bakewell. On Saturday, September 19, in front of the LA Sentinel at 3800 S. Crenshaw Blvd., in partnership with Children’s Hospital, help us make sure other kids will get to celebrate their birthdays, graduations and the rest life as to offer. Sign up to volunteer the day of the event by clicking on this link: http://www.sabriyascastle.org/blood-drives.html.